I don’t drive, and in my everyday life and am not in a car very often, maybe a couple of times a week. 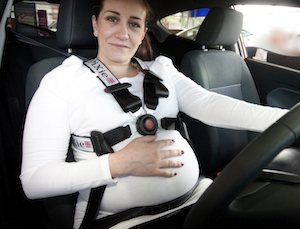 When I went to book in my pregnancy with the midwife she explained how important it was to continue to wear a seatbelt as normal throughout pregnancy. I didn’t really understand the correct way to wear a seatbelt. At 24 weeks I was in Germany visit my mother in law, we were in the back seat of the car together going on an outing, she happens to be a midwife, and she looked at how I was wearing my seatbelt and explained it was all wrong. When we got home she showed me the RoSPA guidelines We then went back into the car to try and get the seatbelt to sit properly. We failed. I’m not sure whether it was because my bump was covered by a layer of fat, or what the issue was, but the lap belt just wouldn’t stay put across my pelvis and we couldn’t get the vertical belt to sit nicely between the breasts. In a car accident, my baby would have been in danger. I assumed as I got further along it would get easier, but of course, with my pregnancy ending at 27 weeks, it was no longer an issue and I thought no more about it! One Sunday night a week or so ago I learnt about the Pixie Harness through Twitter, and went on the website to see what it was all about. I started turning from sceptic to a believer in this product and wanted to learn more. Imagine my surprise when I discovered that Steve, the inventor of this harness, has his premises literally up the road and around the corner from my house! As I spoke to Steve I was immediately struck by his passion for this device, and his diligence. He has been developing this for years, he showed me various prototypes and went into minute detail about how he developed the harness. This is a premium British product, and manufactured in the same way as racing harnesses. It is designed to take the impact away from the bump, thus protecting the baby and importantly the placenta. No one knows how many babies are lost due to accidents each year, as the death of a foetus is not reported, much less investigated. But undoubtedly babies are at risk due to car accidents, and as Steve explained, it can often be a low impact accident that does the damage, a bump in a car park that we might not think twice about, for example. I will blog further about this device in coming weeks, and just wanted to introduce you to it today. But before I go, I did want to talk a little about cost. It’s the first thing I noticed when I visited the website and wondered, really, if I wanted to blog about the device at all. Pregnancy and the babies first year is an expensive time and I did query whether this was too much to pay initially. However, as I learnt more about what has gone into this device, and how it has been produced, I was reassured, and further, I started looking at it this way: we insure our cars, none of us like to think that we will have an accident but we diligently pay our insurance year upon year. We pay a lot of money for car seats for our babies, toddlers and children and don’t think twice about making sure they are appropriately restrained. Surely it makes sense to ensure our children are appropriately restrained from the moment we know about them. Additionally, how many days long is pregnancy? About 280, so let’s say you start using this at 12 weeks, that’s around £1 a day, and if you have another pregnancy, you can bring that down to 50 pence a day. When you look at it that way, I don’t think it’s too much to spend, particularly, like many women, you are driving every day. Later in the week I will blog more about how the device works, how it fits into the car (which is so easy even I can do it!) and answer any questions you may have, with the help of Steve. If you have any questions, you can tweet them to me or to Steve, or leave them in the comments box below. Start following our trades today and gain up to 270% daily.